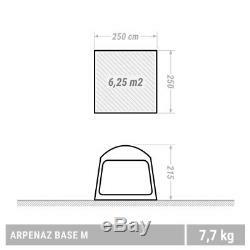 QUECHUA ARPENAZ BASE FRESH MEDIUM CAMPING SHELTER 8 MAN. Designed for 8 people camping wishing to protect themselves completely from the rain, sun, wind and insects. Living area for up to 8 people. Free standing structure, easy to pitch. Living area that is completely protected from the elements thanks to 2 doors and large mosquito net. Capacity 6.2 sqm on the ground. Enough space to seat 8 ppl at a table. Easy assembly / dismantling Self-supporting structure, easy to pitch: Fibreglass poles. Heat reduction The shelter opens on 3 faces equipped with 3 mosquito nets. Darkness N The fabric filters UV rays with SPF 30. Durability Resists wind up to 50km/h (Force 6):tested in wind tunnel on turning platform Easy transport Carry strap. Cover:57 cm x 18 cm x 18 cm 18 litres, weight: 7.7kg Waterproof Tested in a shower at 200 mm water / hour / m² (tropical rain) and field tests. 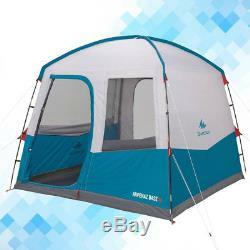 Living room Square shelter 2.5 m side, 6.25 sqm with maximum height of 2.15m. Bag: Cylindrical: 57 cm x 18 cm x 18 cm. Pitching/folding Very simple pitching and unpitching. We insert 2 poles in loops on the ground, insert the ends of the loops in the cups on the 4 corners. Once the shelter is pitched, peg the 4 corners and the red strap across the side door. Finish off with 4 guy ropes for maximum wind resistance. Protection from the sun The flysheet fabric filters out UV rays with an SPF of 30. Please note: a large amount of UV can pass through a simple open door. Shaded area one side to provide further protection from the sun. Dimensions and weight, folded dimensions Cylinder cover: 57 cm x 18 cm x 18 cm 18 litres, weight: 7.7 kg. Ventilation 3 openings with mosquito nets on 3 faces to enable great air circulation and maximum protection against mosquitoes. Waterproofing The waterproofing of QUECHUA tents is tested on the complete tent, under 200 litres water/hour/sqm (200mm of rain per hour) for 4 hours. The water column test (= mm schmerbers) measures just the impermeability of the fabric. Our test enables the ingress of water through seams, flaps, openings, zips, etc to be prevented. WIND RESISTANCE We test all our tents in a wind tunnel on a turntable to expose each side of the tent to the wind. The well-pitched tent with all the guy ropes rigged around the tent must remain habitable in wind speeds of 50 km/h measured near the ground. Poles, pegs Poles: All our fibreglass poles undergo a double quality control guaranteeing excellent resistance to breakage. Tent pegs: Excellent twisting resistance (6mm diameter steel). Tent pegs: In galvanised 5mm diameter steel for good resistance to torsion. Eco-design The fabric is coloured with a dye that uses less water and pollutes less. Pole: 100.00% Glass - Fibre (FG) Main fabric: 100.00% Polyester (PES) Groundsheet: 100.00% Polyethylene(PE) Care instructions: Rinse in clean water after use. 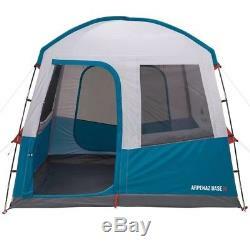 STORAGE - after use or cleaning, only store the tent completely dry to prevent the development of odours and mould. UV can enter through the opening (reflects on light ground). The item "QUECHUA ARPENAZ BASE FRESH MEDIUM CAMPING SHELTER CAMPING TENT 8 MAN" is in sale since Tuesday, July 10, 2018. 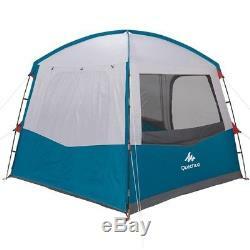 This item is in the category "Sporting Goods\Outdoor Sports\Camping & Hiking\Tents & Canopies\Canopies & Shelters". The seller is "mycosmetix23" and is located in EU.